The Eye on Earth Summit took place in Abu Dhabi on the 12 to 15 December 2011, and focused on ‘the crucial importance of environmental and societal information and networking to decision-making’. The summit was an opportunity to evaluate the development of Principle 10 from Rio declaration in 1992 as well as Chapter 40 of Agenda 21 both of which focus on environmental information and decision making. The summit’s many speakers gave inspirational talks – with an impressive list including Jane Goodall highlighting the importance of information for education; Mathis Wackernagel updating on the developments in Ecological Footprint; Rob Swan on the importance of Antarctica; Sylvia Earle on how we should protect the oceans; Mark Plotkin, Rebecca Moore and Chief Almir Surui on indigenous mapping in the Amazon and many others. The white papers that accompany the summit can be found in the Working Groups section of the website, and are very helpful updates on the development of environmental information issues over the past 20 years and emerging issues. Interestingly, Working Group 2 on Content and User Needs is mentioning the conceptual framework of Environmental Information Systems (EIS) which I started developing in 1999 and after discussing it in the GIS and Environmental Modelling conference in 2000, I have published it as the paper ‘Public access to environmental information: past, present and future’ in the journal Computers, Environment and Urban Systems in 2003. Discussing environmental information for a week made me to revisit the framework and review the changes that occurred over the past decade. First, I’ll present the conceptual framework, which is based on 6 assertions. The framework was developed on the basis of a lengthy review in early 1999 of the available information on environmental information systems (the review was published as CASA working paper 7). While synthesising all the information that I have found, some underlying assumptions started to emerge, and by articulating them and putting them together and showing how they were linked, I could make more sense of the information that I found. This helped in answering questions such as ‘Why do environmental information systems receive so much attention from policy makers?’ and ‘Why are GIS appearing in so many environmental information systems ?’. I have used the word ‘assertions’ as the underlying principles seem to be universally accepted and taken for granted. This is especially true for the 3 core assumptions (assertions 1-3 below). Sound knowledge, reliable information and accurate data are vital for good environmental decision making. Within the framework of sustainable development, all stakeholders should take part in the decision making processes. A direct result of this is a call for improved public participation in environmental decision making. Environmental information is exceptionally well suited to GIS (and vice versa). GIS development is closely related to developments in environmental research, and GIS output is considered to be highly advantageous in understanding and interpreting environmental data. (Notice that this is emerging from combining 1 and 2) To achieve public participation in environmental decision making, the public must gain access to environmental information, data and knowledge. (Based on 1 and 3) GIS use and output is essential for good environmental decision making. 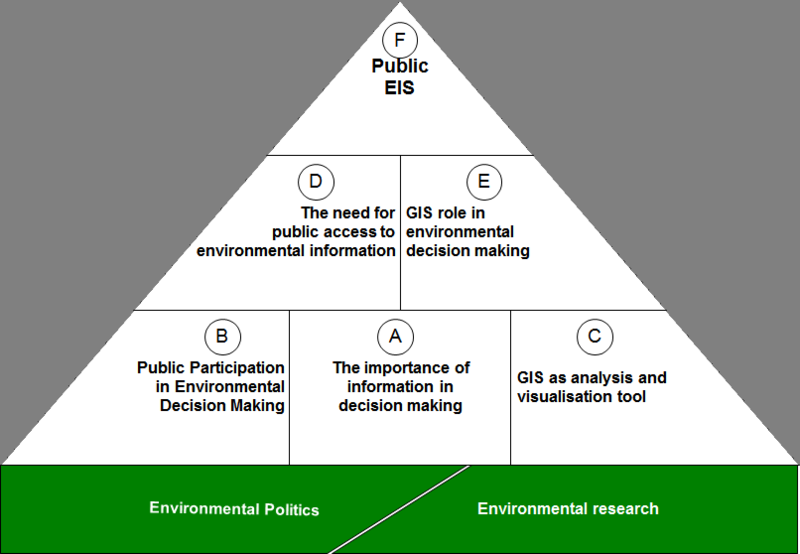 (Based on all the others) Public Environmental Information Systems should be based on GIS technologies. Such systems are vital for public participation in environmental decision making. Intriguingly, the Eye on Earth White Paper notes ‘This is a very “Geospatial” centric view; however it does summarise the broader principles of Environmental Information and its use’. Yet, my intention was not to develop a ‘Geospatial’ centric view – I was synthesising what I have found, and the keywords that I have used in the search did not include GIS. Therefore, the framework should be seen as an attempt to explain the reason that GIS is so prominent. With this framework in mind, I have noticed a change over the past decade. Throughout the summit, GIS and ‘Geospatial’ systems were central – and they were mentioned and demonstrated many times. I was somewhat surprised how prominent they were in Sha Zukang speech (He is the Undersecretary General, United Nations, and Secretary General Rio +20 Summit). They are much more central than they were when I carried out the survey, and I left the summit feeling that for many speakers, presenters and delegates, it is now expected that GIS will be at the centre of any EIS. The wide acceptance does mean that initiatives such as the ‘Eye on Earth Network’ that is based on geographic information sharing is now possible. In the past, because of the very differing data structures and conceptual frameworks, it was more difficult to suggest such integration. The use of GIS as a lingua franca for people who are dealing with environmental information is surely helpful in creating an integrative picture of the situation at a specific place, across multiple domains of knowledge. However, I see a cause for concern for the equivalence of GIS with EIS. As the literature in GIScience discussed over the years, GIS is good at providing snapshots, but less effective in modelling processes, or interpolating in both time and space, and most importantly, is having a specific way of creating and processing information. For example, while GIS can be coupled with system dynamic modelling (which was used extensively in environmental studies – most notably in ‘Limits to Growth’) it is also possible to run such models and simulations in packages that don’t use geographic information – For example, in the STELLA package for system dynamics or in bespoke models that were created with dedicated data models and algorithms. Importantly, the issue is not about the technical issues of coupling different software packages such as STELLA or agent-based modelling with GIS. Some EIS and environmental challenge might benefit from different people thinking in different ways about various problems and solutions, and not always forced to consider how a GIS play a part in them.